Bulgarian Folk Objects Come to Life! 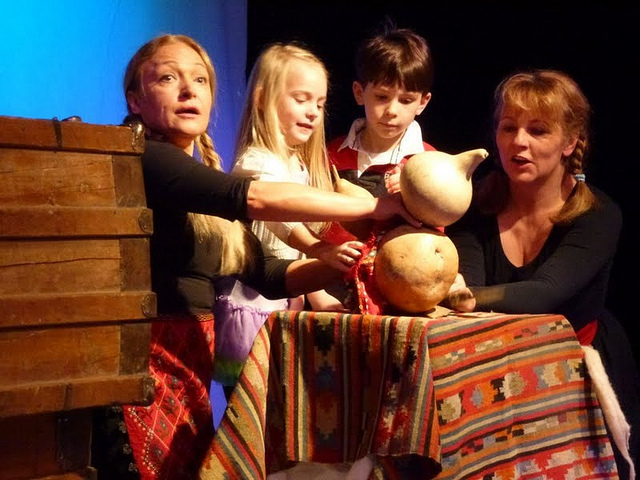 The renowned Bulgarian director Lilia Slavova and master puppeteer Julia Tasheva bring their third installment of a series of workshops based on Bulgarian folklore. Come join Bulgarian artists hand in hand for an amusing trip of imagination and fantasy accompanied by music, dance, and songs. Common objects from the near past, with the help of young audience members, will find new life and take us on a journey of Bulgarian folk tradition and culture.A cheerful educational workshop full of music, songs and puppets that invites the young and not so young audiences on stage and introduces them to Bulgarian ethnography and traditions! The workshop employs historic Bulgarian folk items to create unexpected puppets that come to life in the hands of young workshop participants. Traditional singing and dancing will also be featured. Julia Tasheva is an award-winning master puppeteer and mime artist with professional experience on two continents. Lilia Slavova is an award-winning director, actress, and acting coach living on both continents. Both artists received the inaugural Kiril and Metodi Bulgarian Culture Award, amongst numerous other awards and recognitions both as performers and directors. A cheerful educational workshop full of music, songs and puppets that invites the young and not so young audiences on stage and introduces them to the Bulgarian ethnography and traditions! Come and join us hand in hand for an amusing trip of imagination and fantasy with the help of Bulgarian Folk Music and everyday objects from the near past .In the hands of skillful Bulgarian artist they will find new life and take us on a journey of the Bulgarian folk tradition and culture.